CompEx EX11 mechanical course significantly updated with new core competence assessment. ExVeritas is now providing a significantly updated CompEx Ex 11 Course that covers the new ‘Ex h’ requirements with a new updated exam and a new pipe integrity practical assessment to prevent against ‘loss of containment’ of flammable materials. 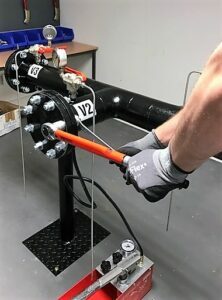 Candidates undertaking EX11 at ExVeritas who successfully pas the exams and assessment will now have a certification that also covers flange integrity installation as well as installation an inspection of ‘Ex’ non-electrical equipment. A new practical installation element has been added to EX11 based around a newly designed Flange integrity assembly. Candidates will be asked to follow instructions on the choice of flange, bolts (Including torque settings) and type of gasket required. 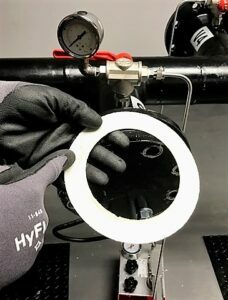 Once the assessment is complete the assessor will inspect the gasket and check for damage and the joint will be pressure tested. Flange assembly, blanking of flange. 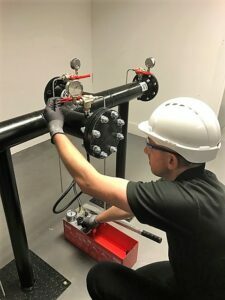 30-minute flange integrity practical. Selection and fitting of appropriate gaskets, bolts and flange blanks, pressure testing and safe removal. CompEx EX11 is suitable for all personnel who may be required to break and isolate pipes to install or maintain Ex equipment such as pumps etc., and personal who may need to select, install or maintain Ex non-electrical equipment.